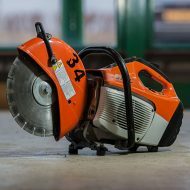 Road saw for continuous cutting through concrete, masonry and asphalt (subject to blade type). Combining good cutting performance with acceptable transport weight. Fitted with 25LTR water tank for dust suppression. Use of the Cat scanner before use will help detect hidden services .